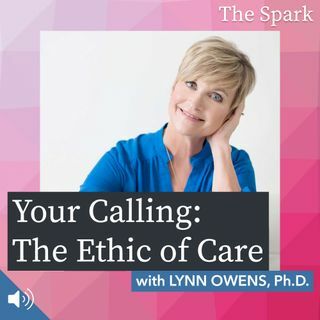 The Spark 021: Your Calling: The Ethic of Care with Lynn Owens, Ph.D.
How can we be our best selves and harness our best potential? How do we focus on what's right with us instead of what's wrong? Lynn M. Owens, Ph.D. is a passionate educator who empowers others to care for themselves and others, to harness the strengths of their personality and to maximize their performance in all areas of their lives. From corporate CEO’s to multi-level marketing professionals, from educators to athletes, Lynn provides valuable insight into how to lead and teach ... See More from strengths. Lynn is the co-author of the new book, Catch and Release: Becoming a Teacher Who Changes Lives, available now at all fine booksellers.